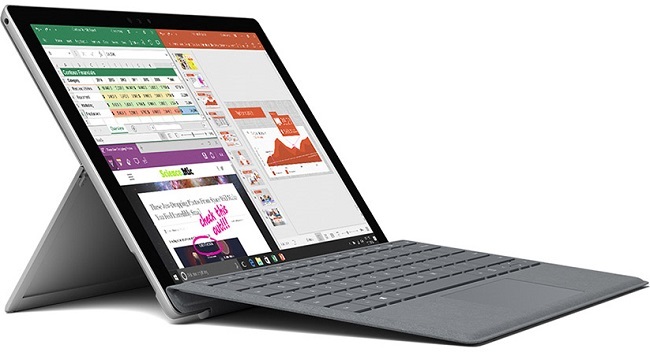 The Microsoft Surface Pro 2017 Tablet gives you a versatile user experience. It is light enough to carry anywhere and powerful enough to use as a desktop workstation. It features a built in kickstand and a deeper hinge that allows you to work in different modes that include laptop mode, studio mode, tablet mode. This Microsoft tablet sports a vibrant, 12.3inch display that renders images at an incredible resolution of 2736 x 1824 pixels for a lifelike visual experience. The display is powered by PixelSense technology that offers accurate response even by the subtlest touches of your fingers. The Microsoft Surface Pro is engineered to give you smooth and efficient workflow so that you can stay productive even when you are on the go. It is powered by , Intel processor that runs full desktop apps and your favorite creative tools smoothly while keeping the power consumption in check. This Surface Pro tablet features a fanless cooling system that lets you work or play for long hours without any discomfort. Also, the impressive battery life of up to 13.5 hours adds to the high productivity of this tablet. The Microsoft Surface Pro comes preinstalled with Windows 10operating system that offers the latest features to give you an intuitive experience. 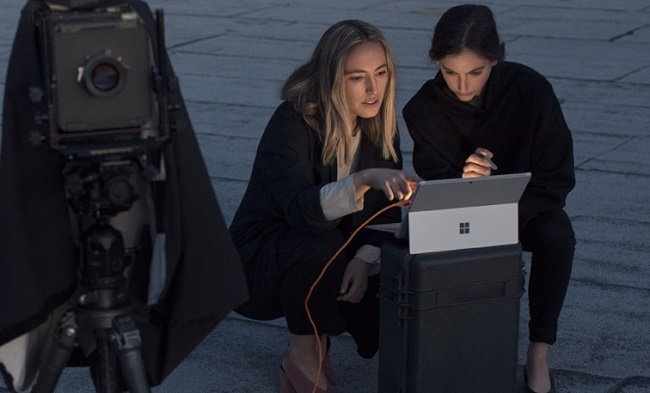 The Microsoft Surface Pro, with its multi position kickstand and an advanced hinge, gives you the freedom to study, create, work and play virtually anywhere. By adding a Surface Pro Signature Type Cover and a responsive keyboard, you can use this tablet in laptop mode. Also, you can lower the kickstand to use this tablet in studio mode. 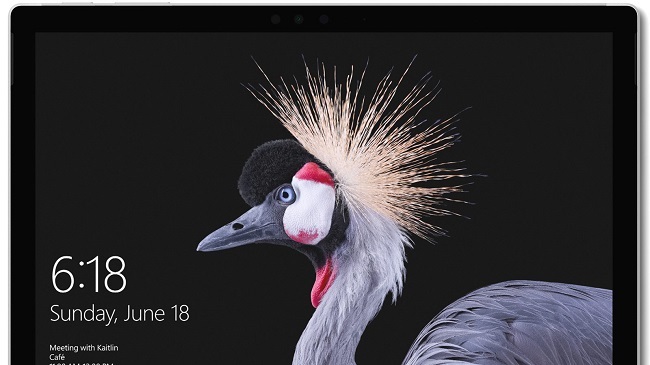 This Microsoft tablet features a 12.3inch display that delivers brilliant colors at a razor sharp resolution of 2736 x 1824 pixels Watch your ideas come to life in brilliant color and razor-sharp resolution on the 12.3” PixelSense Display with a stunning screen that responds to the new Surface Pen and touch. 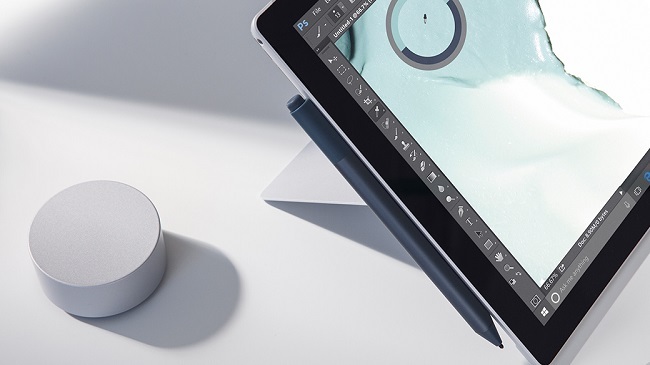 Surface Pro works perfectly with Surface Pen, Surface Dial and Office and runs the full Windows experience, including 3D creation tools. Enjoy fast, secured, password-free sign-in with Windows Hello.